Sign up for IRmep's periodic email bulletins! New IRmep book now available! IRmep policy briefs and are circulated to concerned citizens, key legislators and foreign policy makers. They provide an analysis of current US foreign policy in the Middle East, analysis of true US interests, and strategies for closing the gap. IRmep believes Congress needs to come together and staunch the steady bleeding of American taxpayers, which is now entering its fifth year. While we've opposed the US invasion since before it began, there are five reasons why even supporters of a so-called "Global War on Terror" now need to pull the plug before the Iraq debacle brings America to its knees. Reason #1: A "Credit Card" War Drags on Future Generations. The United States is financing the Iraq occupation with deficit spending. In 2003 Americans rightly rejected the neoconservative plan for the Department of Defense to "lease" air tankers for Middle Eastern air wars. That case rightly put Pentagon and industry officials (though not the authors of the plan) behind bars. Americans saw the deal for what it truly was: corruption. Americans are now rejecting the idea that the cost of the misguided Iraq war is being passed on to our future generations who will be repaying creditor nations such as China that purchase US government bonds financing this disastrous war. Like the tanker deal, Americans usually reject the idea of paying interest above and beyond the base cost national security interests. The Iraq war was deficit financed because it never was vital to the US's true defense needs. The shell game of hiding the cost of the war to make it palatable to American taxpayers is no longer feasible as interest rates climb and the value of the dollar plunges. The "credit card financed war" game is up. 10/5/2006 Israel Lobby Initiates Hispanic Strategy "Invademos a Iran"
AIPAC, the tip of the Israel lobby spear in Washington, began an executive search for a Deputy Director for Hispanic Outreach (PDF) in August of 2006. Reporting directly to AIPAC's "National Outreach Director" in Washington, the responsibility of the new deputy director will be to "develop relationships with key members of the Hispanic community and encourage their involvement in political advocacy in support of the US-Israel relationship." AIPAC's focus on the Hispanic community dovetails with an unprecedented opportunity for Spanish language media outreach. Shareholders of Univision Communications, the leading Spanish-language broadcaster in the U.S., voted to sell the company last week to a group of private-equity firms for $12.3 billion. The deal was signed even though a higher bid from Mexican TV giant Grupo Televisa was still on the table. Led by media mogul Haim Saban, the US group acquired the equivalent of the "ABC" network in terms of Spanish speaking US viewership. Among all Spanish-language US networks, Univision averaged 3.7 million viewers followed by Telemundo at 880,000 and TeleFutura's 660,000 viewers. 8/29/2006 The Clean Break Plan: A Conspiracy of Theories? 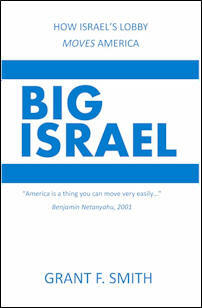 After being elected as Israel's Prime Minister in 1996, Binyamin Netanyahu called on a group of policy advisors in the United States to outline policy recommendations and future strategies Israel can adopt in dealing with the U.S., the Palestinians and the Arab countries. The group, which included Richard Perle, Douglas Feith and David Wurmser, produced a document called, �A Clean Break: A New Strategy for Securing the Realm.� The document, which has been made public and analyzed by Smith and the Institute for Research: Middle Eastern Policy, is being re-examined because many of the recommendations, mainly toppling the government of Iraq, moving away from the land for peace formula with the Palestinians and the destabilization of �regional challengers� such as Syria, Iraq and Lebanon, are in full implementation. There is much hubbub over the potential for Hamas to enter as a significant player in the Palestinian government. Neoconservative pundits warn that this will put the �terror masters� in control of any future Palestinian state, leading to chaos and horror for Israel and the region. On December 12, 2005, the US Energy Information Administration (EIA) released a revised oil price forecast through year 2030. On the supply side EIA sees increased use of coal and nuclear energy as OPEC output grows more slowly than previous estimates. Most jarring to American consumers is a $21 jump in per barrel prices. The revised forecast also predicts increasing reliance on foreign energy suppliers even as the US increases domestic production. Israeli government officials recently disclosed that at least US $60 billion has been spent financing illegal settlements in the occupied West Bank and Gaza. According to Israeli prosecutor Talia Sasson, the Israeli government has systematically violated its own laws by financing settlements from foreign donations, the official state budget and secret military accounts. One global nonprofit, the World Zionist Organization, played a central role in coordinating illegal settlement activities. Opaque and fungible assets freed up by massive yearly US foreign aid to Israel are pouring into settlement development and infrastructure building designed to partition key Palestinian territories and annex others to the state of Israel. US nonprofits are directly and indirectly financing the coordination of illegal settlement building, encroachment, and violence against Palestinians. Recently disclosed charitable contributions from US lobbyist Jack Abramoff laundered to finance violent armed Israeli activity in the Palestinian territories is only the tip of the iceberg. Considered against the findings of a groundbreaking new study revealing the causes of suicide terrorism, Americans must confront a disturbing question: "Are tax exempt donations from the US generating terrorist retaliation against America?" On April 28, 2005 the Defense Security Cooperation Agency notified Congress of the sale of 100 GBU-28 "bunker buster" guided bombs to Israel. Designed to penetrate hardened command centers located deep underground, the GBU-28 is a 5,000-pound laser-guided bomb that uses a 4,400-pound penetrating warhead and contains 630 pounds of high explosives. The Israeli target for the GBU is no secret. For months Israeli intelligence, political and policy operatives in the US have been presenting a case that Iran is secretly developing nuclear weapons that threaten Tel Aviv and other Israeli population centers. American skeptics will recall similar statements by Ariel Sharon who made claims along with a network of American pundits that Iraqi weapons of mass destruction had been shipped into Syria at the start of the US invasion of Iraq. Although the 1,700-member Iraq Survey Team responsible for hunting WMD in Iraq officially announced on April 23, 2005 it found no evidence of any weapons of mass destruction or transfer to Syria, proponents of conflict with Syria and Iran continue to push their case forward. Like misleading intelligence claims about Iraq, a GBU-28 sale could trigger an immediate, needless and bloody conflict, only this time between the US and Iran (see Exhibit 1). Whether or not Iran is currently pursuing nuclear weapons, American interests are best served if all nuclear proliferation in the Middle East is reversed. Unfortunately, recent US policies have only created conditions in which nuclear weapon acquisition is seen as a means of survival for countries on the neoconservative policy target list. From the Iranian perspective, Israel has not only successfully developed its own arsenal of nuclear weapons under a policy of strategic ambiguity, it has also shaped US policy through American neoconservatives with ties to the Israeli Likud party. American citizens must demand an effective counter proliferation strategy toward Tehran that first eliminates the policy of strategic ambiguity operating in Tel Aviv and Washington. Saudi Accountability or US Job Elimination Act? The Saudi Arabia Accountability Act of 2003 now under consideration in Congress is rife with problems. Although the bill hopes to address the global scourge of terrorism, evidence cited in the act is inaccurate, obsolete, or narrow to the point of discriminatory. A consequence of passing the bill into law would be heavy US employment losses. In 2003 US global exports partially recovered from post 9/11 trade declines. US exports to Saudi Arabia currently provide 124,000 jobs in America and should reach 177,000 by 2012. However, like many other countries, Saudi Arabia has shown a capability for self-defense through economic retaliation. This could translate into 81,000 lost jobs in the US beginning in 2004. Most Americans reject disinformation and haste as a basis for sound solutions to complex global problems, especially in the Middle East. The Saudi Arabia Accountability Act lacks the integrity, accuracy and responsibility that form the foundation of American law. The U.S. share of world merchandise exports to the Arab Middle East slid from 18% in 1997 to 13% in 2001. This occurred during import demand growth averaging 1% per year and voracious demand for high value-added capital goods among Arab economies. The hardest hit U.S. export sectors include civilian aircraft, agriculture, heavy transportation, as well as telecommunications and industrial equipment. On the demand side, the broad U.S. export downturn is driven by growing Arab boycotts against U.S. consumer and industrial goods. These occur as a response to the perceived loss of U.S. regional foreign policy legitimacy as seen through the eyes of Arab buyers. On the supply side, the increasing restrictions on Arab business travel to the United States, and surging U.S. fear, xenophobia and legal campaigns leveled against Arab business are positioned to accelerate the toll on future trade. The IRMEP estimates that America has already lost U.S. $31 billion in exports between 1998 and 2002. If the trend continues, the U.S. stands to lose an additional U.S. $63 billion through 2007 for a ten year export loss of U.S. $94 billion. Clean Break or Dirty War? ...Great changes are seldom achieved without a plan. The Israeli policy paper A Clean Break: A New Strategy for Securing the Realm (ACB) was authored by a group of policy advisors to Israel. Subsequently, nearly all members became influential policy makers operating within U.S. government, media, and academic circles. Many of the ACB policies such as toppling the government of Iraq are now in full implementation and present new challenges to the entire global community. Others, such as the reform of Israel's economy have been abysmal failures, though generating little visibility or impact outside of Israel. In this paper, we evaluate the level of implementation of these five summary goals, and their effect on the interests of the United States. However, no set of policies ever come to fruition without an active and vocal distribution and implementation network. ACB's legion of American shock troops are many. At its core, key operatives (called the Neocons), working within the Bush Administration, policy research think tanks, specialty press, and opinion columns have achieved amazing success at seasoning and baking ACB policy agenda items within the tenuous mold of vital interests of the United States itself. Copyright 2002-2016 IRmep. All Rights Reserved.